The site, the naturally fortified and strategically important hill of Byzantine Myzithra, north of Taygetos, is a medieval castle and the fortified settlement that encloses within the walls of monasteries, churches, chapels, houses and palaces. The Frankish castle with the battlements and towers was founded by William II de Villeharduin and was later reinforced by the Greeks and the Turks. The walls. The two strongly fortified circuit walls were strengthened by tall, rectangular towers, dated to the Late Byzantine period. The Cathedral of St. Demetrios. It belongs to a mixed architectural type: it is a three-aisled Basilica on the ground floor with a narthex and a bell tower (dated to the second half of the 13th century), and a cross-in-square church on the upper floor (added in the first half of the 15th century). The interior is decorated with wall paintings representing many different styles, dated to the period between 1270/80 and the first quarter of the 14th century. The wall paintings of the dome date to the 15th century. Church of Saints Theodore. It was built between 1290 and 1295 by the monks Daniel and Pachomios. It is of the octagonal type, with lateral chapels, and is decorated with wall paintings dating from the end of the 13th century. Church of Our Lady Hodegetria (the Leader of the Way). It was built in 1310 by abbot Pachomios. It belongs to the mixed architectural type with a narthex and lateral chapels and is decorated with excellent wall paintings, dated to 1312-1322, some of which are connected to the Constantinopolitan art. Church of Aghia Sophia (Holy Wisdom). Domed, cross-in-square, two-column church, built in the middle of the 14th century. It has side chapels and a bell-tower. Remarkable wall paintings are preserved in the sanctuary and the chapels. Church of Our Lady Evangelistria (of the Annunciation). Domed, cross-in-square, two-column church decorated with wall paintings of the beginning of the 15th century. Urban buildings. The most interesting of the urban buildings erected on the hill are the Palataki (Small Palace), the House of Frangopoulos and the House of Laskaris. 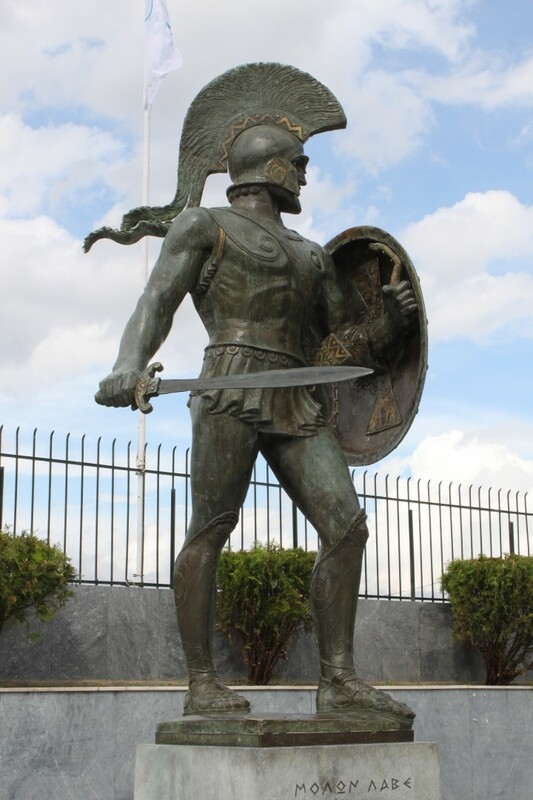 The Archaeological Museum of Sparta is a museum in Sparta in Greece. It houses thousands of finds from the ancient Acropolis of Sparta, known as the Lakedaemonia, but also from the rest of the municipality of Laconia.